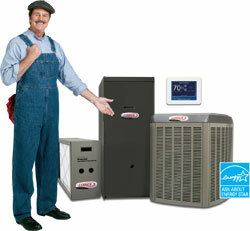 J & K Air Conditioning & Heating has been servicing Montgomery County MD since 1981. We are a family owned and operated service company. J & K Air Conditioning services all of Montgomery County Maryland from our Gaithersburg MD location including Bethesda, Chevy Chase, Damascus, Germantown, Rockville, Kensington, Olney, Potomac, Silver Spring, Takoma Park, Wheaton and Frederick, Maryland. We service all of Prince Georges and Frederick Counties in MD and Fairfax County in VA.
For new installations, we supply Carrier and Lennox products for all of your air conditioning and heating requirements. We service all brands and repair humidifiers and air cleaners. Our service contracts will keep your air conditioning and heating equipment in excellent working condition. Don't wait too late. Give us a call. We are always happy to help you. We have openings for experienced HVAC techs or residential installers. or call our office at 301-990-0780. Ellie, Marc, and I can't thank you enough for going out of your way and extending your day and enduring miserable traffic to repair Marc's AC unit. 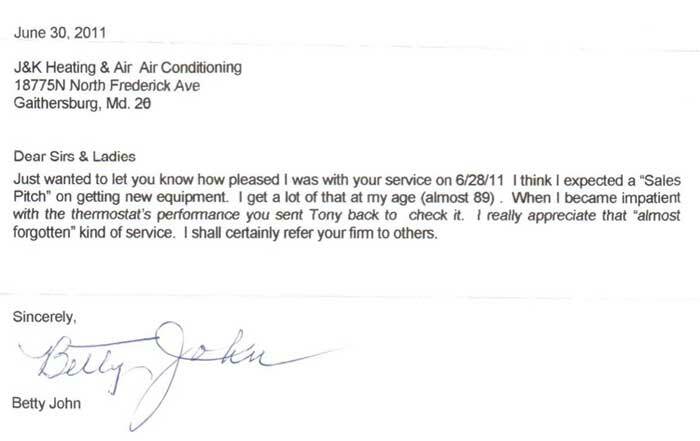 Your quality service is extraordinary and that is why we have had a relationship with J&K for over 30 years and always gladly refer those in need of AC and HVAC services to J&K. Last week Ellie posted her glowing remarks re J&K on Facebook and Yelp. Good Service Doesn’t Cost; It PAYS! Our new equipment installation includes 10 year parts warranty, if registered. We will supply a free programmable thermostat with a complete system install. Never a trip or gas charge; time starts when we arrive. Great Customer relations are our priority. We get top ratings in consumer publications and want to maintain this status. with the purchase of qualifying equipment! The perfect system should adapt to your life to deliver the ultimate in energy savings and precision temperature control. We agree. And that's why we're proud to be a leading provider of innovative, home heating and cooling systems. Our high-efficiency, Lennox® residential air conditioners, furnaces and HVAC systems help maximize comfort while reducing utility costs. Plus, our Lennox air filters, humidifiers and dehumidifiers help create healthier and cleaner indoor environments. Call now and save with REBATES UP TO $1,700* OR FINANCE FOR AS LOW AS $116 A MONTH** with the purchase of qualifying equipment! 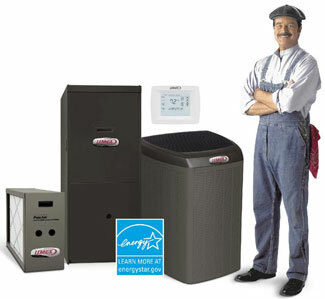 Save on a complete qualifying Lennox® home comfort system that includes a gas furnace or blower coil, an air conditioner or heat pump and thermostat. Enjoy additional product rebates when you purchase an iComfort® S30 Smart thermostat, iHarmony ® zoning and a PureAir system. of qualifying system. Financing available to well-qualifed buyers on approved credit. No down payment required 6.99% APR for 120 months, with equal monthly payments of $116 a month. Normal late charges apply. Cannot be combined with any other promotional offer. Minimum loan amount $3,000. Maximum loan amount $40,000. You may prepay your account at any time without penalty. Financing is subject to credit requirements and satisfactory completion of finance documents. Any finance terms advertised are estimates only. See Truth in Lending disclosures available from lender for more information. We recommend Brill Plumbing for your Plumbing needs.